If you have the 1977 print of Blackmoor Dungeon, or even the Zeitgeist games version, it's easy to think that the maps you have are good to go. But if you try to run a game with these maps, you will soon come to notice stairs that seem to exit above ground without any key or clue as to where. Even the main stair to the basement on level one is not clearly marked. In fact, lining up the stairs from level to level just by looking at the maps is far from easy to do. The only labels the stairs have are "up" or "down" and these don't always seem to be correct. A good long while ago, Tavis Allison of Autarch Games created a GIMP file of levels 1-6 of Blackmoor dungeon and began labeling the stairs in order to line up the levels one on top of another. At that time, I decided to build on what he did by trying to place the stairs and exits that reached the surface onto a map of the castle of Blackmoor. As simple as that sounds there is one very real problem. There is no good surface map of Blackmoor castle. There are two maps of the town of Blackmoor that show the castle, but the scale is tiny. There is also a planview of the main castle building, but it shows nothing beyond the building itself. And so it sat for years. Just so you know what you are looking at, all those letter/number combos are Tavis' staircase notations on various levels. The letter is just a label but the number indicates what levels the stairs are on - in retrospect it probably would have been better to start the label with the level the stair starts on and then give a letter tag, but it is what it is. Notice how the side entrance actually lines up on the side of the building and the castle walls line up with or closely parallel the walls of the basement. There's also a possible second stair inside the castle itself, stair G1234. I didn't show the outer walls on the above image for a reason. My original drawing, based on the blowup of Arneson's '72 map, had the walls fairly close. However, I noticed that on the west (left) side of the castle there was a line of stairs on level 1 that seemed to follow the line of the wall. So I extended the wall over and discovered a remarkable alignment. As it turns out, I should have known to extend the castle walls further out anyway. If you look at Arneson's FFC map of Blackmoor Town and Castle (the one from '77) you can see this same area between the inner and outer wall is larger and is labeled "fair", meaning it is the location of the fair of the elves guarding the castle. So, after trying scores of combinations and configurations, I'm convinced this is the proper fit or as close as is possible to get. However, this would mean that the interior of the castle rooms shown in the FFC has to be wrong! Notice in this image that the throne room is in the smaller right side wing of the castle, while the tower base on the left is occupied by various rooms. According to all descriptions, the main stair (Main 1) should go down from the throne room, and that appears to be what the "A" above is meant to represent. Believe me, I tried dozens of orientations, size variations, mirror images and so forth to get the Main Stair to match with the throne room as shown in this planview. but it simply won't line up in any way that makes any sense of the basement below and the arrangement of the outer walls and towers. However, as you can see from the alignment above, the Main stair lines up quite well with the first floor of the Main tower, so it appears to me that the throne room should be in the tower, not the extension to the east where it is shown. If you ask me, putting the throne room at the bottom of the tower makes more sense anyway. Now we have one more thing to mention. 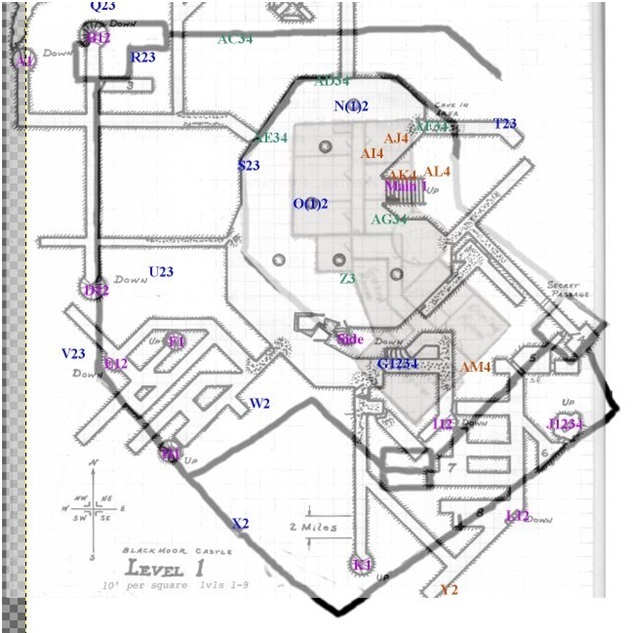 Thanks to Dave Megarry's maps for his character HW Dumbo, we know that the stairs marked "B12" and "D12" do indeed exit on the surface, and that the corridor heading directly west from the basement doesn't just end but actually extends to exit on the hillside. So alright then; using the above map and Tavis's stair labels, here are the surface entrances and their locations around the castle. Let's take a closer look at that last section of Dave Megarry's maps - the one for the SE section of Level 7. What's particularly awesome about these notes on Level 7 is that we can compare them to one of Arneson's original stocking lists. Although the first 6 levels of Blackmoor dungeon published in the FFC are Arneson's Gen con convention restocking list generated randomly using the OD&D booklets, levels 7-10 are original lists, dating to the first year or so of Blackmoor, prior even to the great Invasion that led to King Funk III taking over the 10th Level with his hoards of minions. 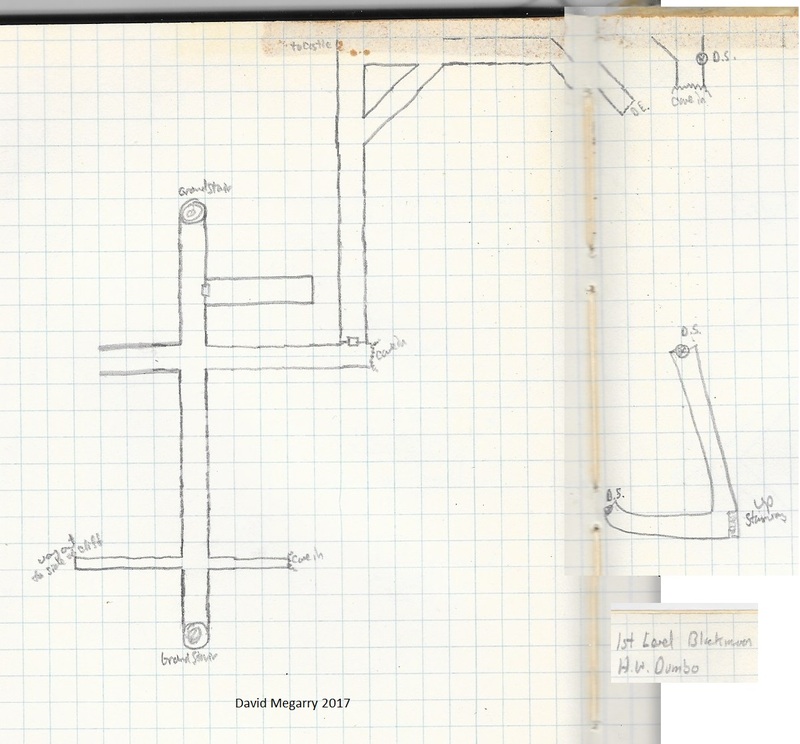 It would not be too surprising for the notes on Megarry's maps to be quite different from the FFC lists. Arneson may have restocked more than once - though perhaps some levels saw more such changes than others. As can be readily seen, rooms 17 and 22 are identical, and that in itself is really quite remarkable. but what about those 200 (yikes!) ghouls in room 19? I think it possible that the editors/typist preparing the stocking list may have misread Goblins as Ghouls. To explain why I think so, I need to refer back to Arneson's "Protection Point" method. In brief, Arneson assigned protection points to a room and then used those points to "buy" the monsters (For a full explanation, please see this post Point Buy Method ). Arneson's goblins are a little more complicated. He actually had two types: one that costs 1.5 points, just as in CHAINMAILTM, and a tougher version that costs 5 points, perhaps a hobgoblin. Ghouls however in the FFC lists always cost 10 points, just at they do in CHAINMAILTM. Notice that the FFC stocking list assigns 300 Protection Points for room 19. To stock the room with 200 Ghouls would require 2000 Protection Points. Three hundred points would give you 30 Ghouls. On the other hand, 300 points would give you 200 standard Goblins. So the number is right if is really Goblins and not Ghouls. Further, Megarry's map has 168 Goblins in this room, and it is easily conceivable that any number of things could have led to those 32Goblins being "missing". So, I think Megarry's map notes have actually helped us find and correct a mistake in the FFC. David Megarry, inventor of the Dungeon! 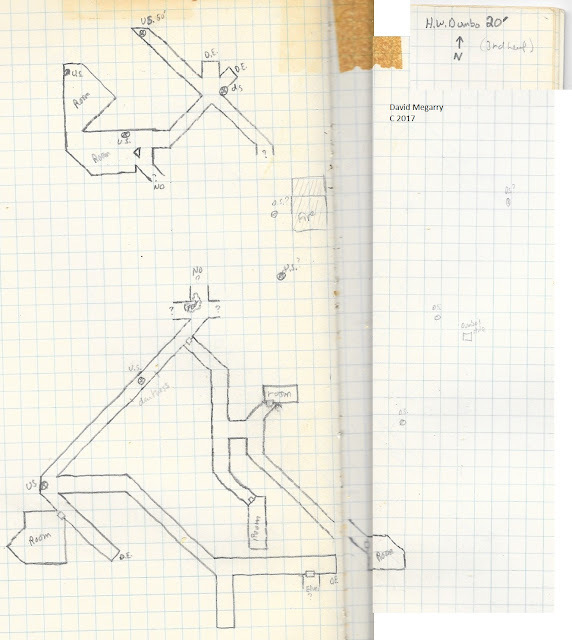 boardgame and one of the original players in the Blackmoor campaign that sparked the creation of Dungeons & Dragons, has once again dug deep into his sea chests and pulled out an old Chemistry notebook with a set of maps on graph paper, drawn from sketches made as his character H.W. Dumbo braved the depths of Blackmoor Dungeon. As discussed previously (here: Early Blackmoor Characters ), H.W. Dumbo was one of David Megarry's characters in the pre D&D Blackmoor game developed and run by D&D co-creator Dave Arneson. As Megarry's 5th created character, he probably came to existence in 1972, but certainly within 1 year of that date. 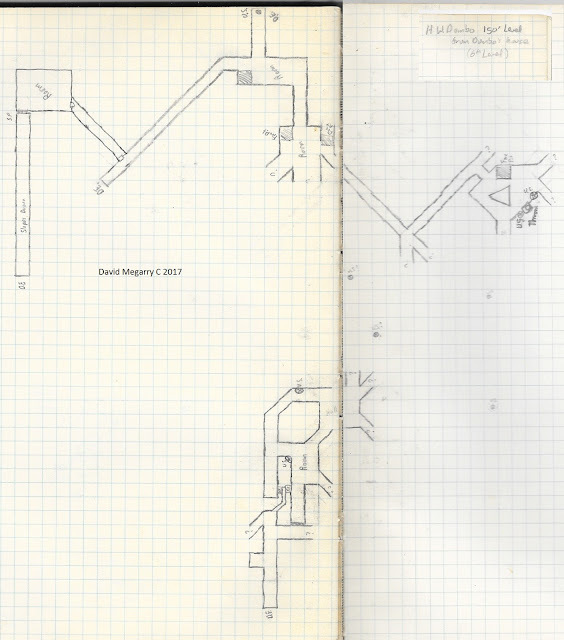 That makes the maps Megarry drew as his character explored Blackmoor dungeon the oldest adventure role playing game maps ever revealed. These maps were drawn in a bound notebook of graph paper at a time before D&D existed, probably even before Gary Gygax was himself introduced to the game, so naturally, a close study of the images reveals interesting details, especially for Blackmoor fans. For comparison, I'll include images from the 1977 First Fantasy Campaign booklet by Judges Guild (JG). 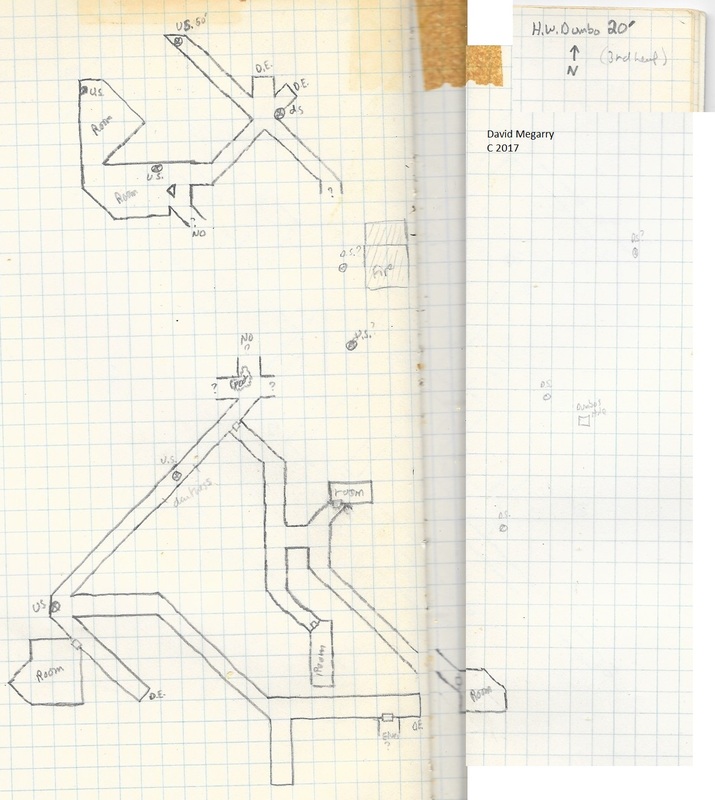 These 1977 maps show the dungeon and key created by Arneson as redrawn for the booklet. 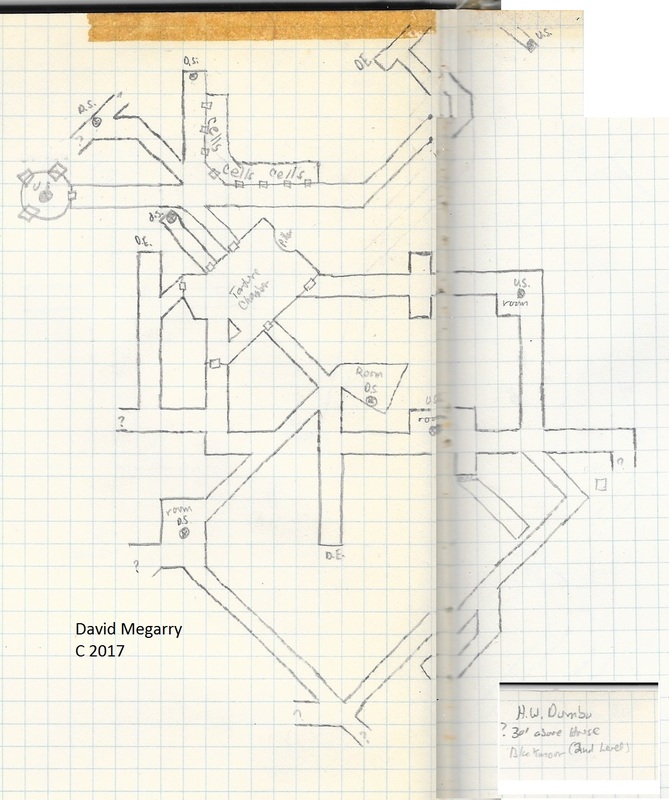 (For a related post see here: # Appearing in Blackmoor Dungeon ) These same maps were, of course, redrawn nearly identically for the Zeitgeist Games (ZG) release of The Dungeons of Castle Blackmoor in 2006, and I'll refer to that publication from time to time also. 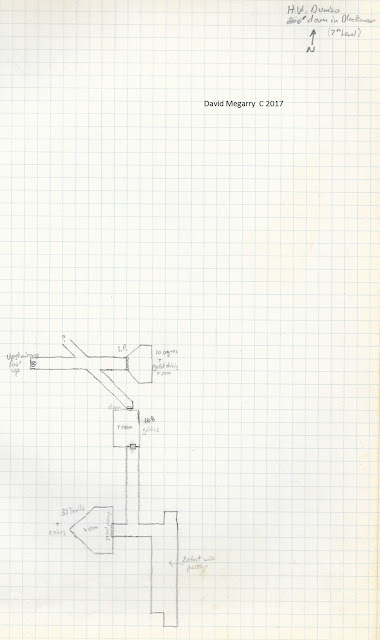 Megarry's scans of his notebook are of whole pages and show a lot of blank space. However, to make the images easier to view, I have cropped together the portions showing the explored areas. We begin with Level 1. First, a bit about notation; Megarry's stairs are little circles. Frequently he marks these as U.S or D. S. - up stairs or down, just as on the JG maps, or as "Grand stair", to indicate both up and down. Passages are also marked D.E. for Dead End. Notice that D.E. appears where room 9 is marked on the JG map - very likely indicating that H. W. Dumbo failed to find the secret door leading into that room. We also see in the passage just to the east of where room 9 isn't, an area marked "cave in", just where the Orchian Way stairs should be. This and other cave ins we will see on Megarry's maps, are probably the result of the earthquake reported in Arneson's newletter the Blackmoor Gazette and Rumormonger released in the fall of 1971. Curiously, the note "to castle" is written near room 2, and very interestingly, there is a note at the western end of the east west corridor at the bottom of the map which reads "way out; the side of cliff." On the JG map the same corridor simply appears to end. The long north/south passage ends in a "Grand stair", indicating both must exit above ground - I'll have more to say about that in a later post - but this does contradict the published JG map where these stairs are labelled down (and probably shouldn't be). Perhaps the first thing to jump out is room 4, marked "Torture" on Megarry's map. In the FFC key, this room is non-descript, but the ZG dungeon key describes this room as the torture chamber of Sir Fang, the vampire. Further there is a mysterious circle on the JG map, which is described as a pit in the ZG text, but on Megarry's map we see only a half circle in that area marked "pillar". I wonder if this might have been one of Arneson's elevator shafts, or probably more likely, some kind of a pedestal. The configuration in room 2 is slightly different but there are the same 8 cells. These are marked "pens" on the JG map. Rooms 5 and 6 are slightly bigger on Megarry's map. "It is located on the isthmus between the town and the castle. It is amazing that Arneson let me dig a tunnel in that area. 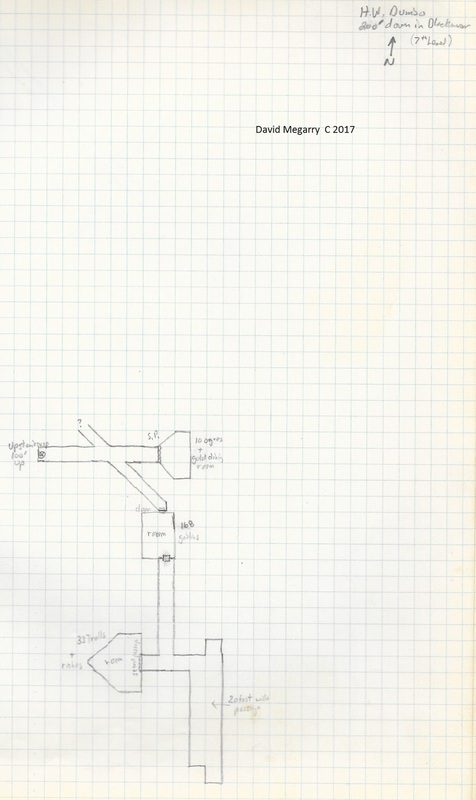 I recall that I dug a tunnel from the northwest shore to the location of the house and then dug down to the 5th level before I connected with the Blackmoor dungeon (I missed other levels by a hair). I earned enough on expeditions to finally build the house, which I put right on top of the down part." There is a slight difference in stair placement in the three pronged passage east of room 2 that could have some significance for map alignment issues. Room 10 is oriented completely differently. In the center east section of the map is a single colored in square marked "H. W.'s hole". That's the location of the tunnel from H. W. Dumbo's house. At the very bottom of the map, near the area between rooms 10 and 12 and in the east/west corridor below them, is a door in the south wall with a hint of the corridor beyond heading south. Here is a note reading "Elves ?". At the North east edge of Megarry's map there is a note that says "Devils Fountain" next to "cave in". Devil fountains are mentioned in the FFC, where they are said to be marked on the maps with black squares. 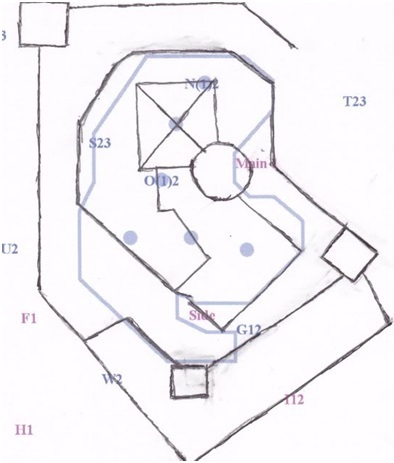 Only level 9 of the JG FFC maps have black squares marked on them, and curiously, that map has a note - probably a mistake -saying the black squares are trap doors. There's also a note on the nearby stairs that says "damaged stair". On the eastern edge, the note reads S.P. 50'. This appears to be the same as the rough hewn passage indicated on the JG map, but at the next hallway just to the west. 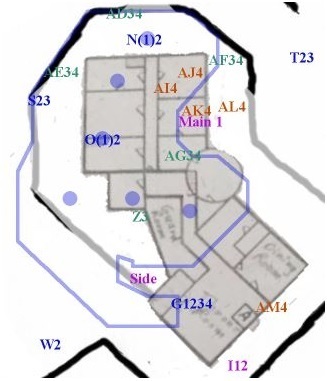 Just east of room 16, there is a feature not shown on the JG map that appears to be the fire pit also shown on level 3. Just east of that, in the north end of the triangular shaped room, a down stair is marked. 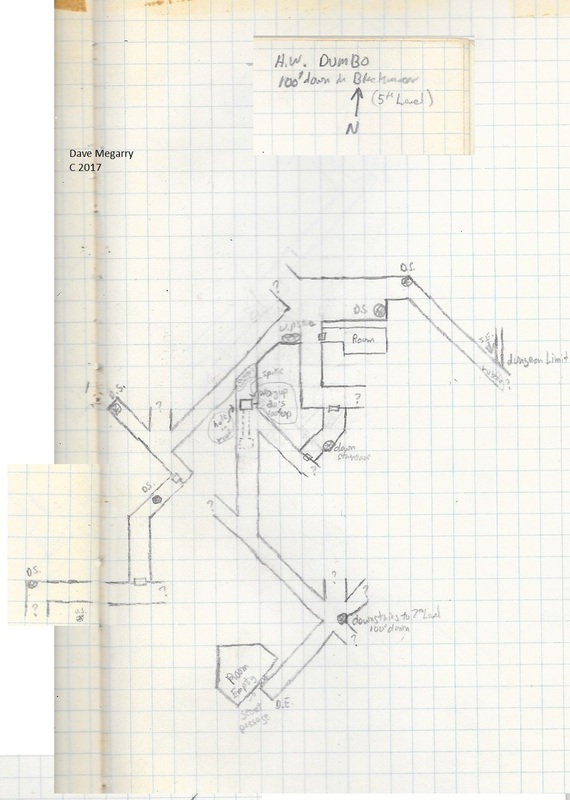 The same stair is marked two squares further north on the JG map, and the significance of this is that the JG map does not align with a stair on level 5, but Megarry's position of this stair lines up perfectly with the published JG map of Level 5. Once again, on the eastern edge of Megarry's map, we see a note against a colored square marked "Dumbo's hole". The note in the upper corner reads "50' from house; down in Blackmoor; (4th level)"
Megarry's map notes this is "100' down in Blackmoor". 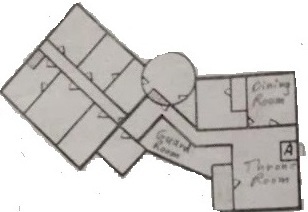 Room 15 is marked "empty" on Megarry's map, but there is a note there that says "secret passage"
Just east of room 15 is a "down stair" in a hallway with the note "...to 7th level 100' down". 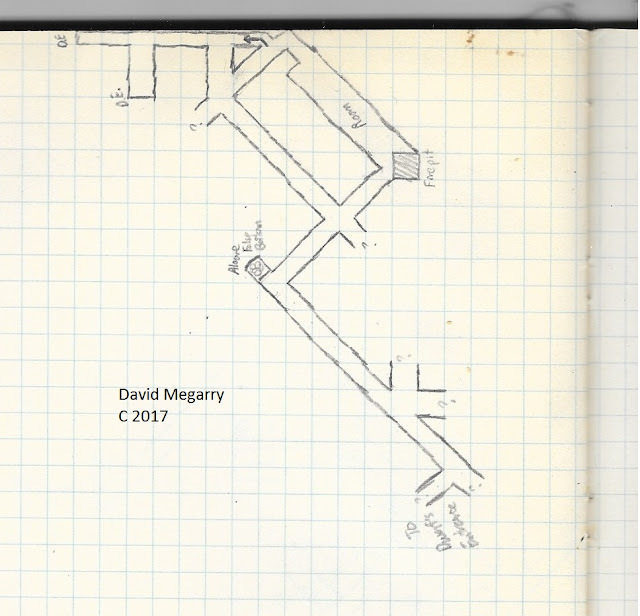 There is also a down stair marked on Megarry's map missing from the JG map - at the end of the hall adjacent (east) of room 4. A little further east, we see the location where the tunnel breaks through. The note reads "Hole in roof". "Way up; 20' S; 100' up". Another little note pointing at a small line in the area says "Spike". The rubble seems to be marked on both maps. Lastly, there is a stair marked in a slightly different position in the room just north of room 5. The corner notation on Megarry's map has "150' from Dumbo's house"
There's some pretty rich notation on the maps for this level. The hatched squares on Megarry's map are marked "fire pit" as on the JG map. The South passage extending from room 1 is marked "slopes down" and the doorway at room 1 is marked "S. P." for secret passage. Room 14 in the JG map has but one stair marked. 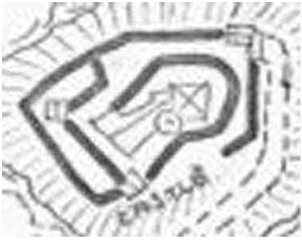 Megarry's map however has two "up" stairs marked on the southeast wall, flanking a semicircle labelled "Throne". Interestingly the Megarry map actually shows a small portion of corridor at the top edge not found on the JG map. The square in room one of the JG map is marked "firepit" on Megarry's map. Also note the area indicated by small dotted lines and the word "down" on the JG map at the northwest end of the corridor in the middle of the image. Megarry has an explanatory note at this location: "Alcove False Bottom". 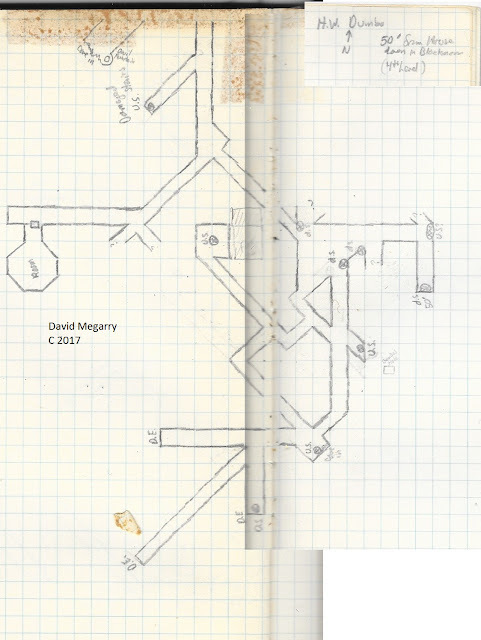 The note at the southeast corner reads enigmatically, "To Dwarfs Entrance"
The corner notation on Megarry's map reads, "200' down in Blackmoor"
This section of the map reveals more of the dungeon inhabitants. The entrance to room 17 is marked with S. P. on Megarry's map and the room itself is noted to have "10 Ogres" and underneath it is somewhat hard to make out, but according to Dave Megarry it reads "gold dinning room". The stair at the west end of the east-west passage extending from room 17 is marked "up stairs 100' up". Room 19 on Megarry's map is marked "168 Goblins"
Room 22 is drawn much larger on Megarry's map and is noted to have a "secret passage" entrance and "33 Trolls + riches"
Lastly, the unnumbered vertical corridor in the southeast corner is marked "20' wide passage", thus confirming the scale of 1 square = 10 feet. I'll have more on HW Dumbo and Megarry's other Blackmoor characters in future posts, but for the maps, that wraps it up for now. I believe some additional information and certainly some related content will shortly be available on the Secrets of Blackmoor documentary Facebook page HERE, so keep an eye on that page.